The WFoV See-Through AR Video Eyewear you've been waiting for? Vuzix has unveiled its latest see through augmented reality video eyewear – with the company hoping that it can show the world how to take on the still unavailable Google Glass. Vuzix's snappily named 'Star 1200 XL Wide Field of View See-Through Augmented Reality Video Eyewear' certainly has some interesting sounding features as it battles the prospect of Google Glass before the project even arrives for public consumption. Not only can the glasses connect up to VGA, component and composite video sources, but they can also use a 3DOF motion tracking sensor and a built in camera to track and recognise the real world and overlay 3D computer generated content. 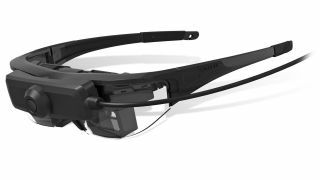 So far, so futuristic, although for those in the know the XL is an enhanced version of the original Vuzix Star 1200 and boasts a 16:9 format WVGA displays and a new 1080p detachable camera. Paul J Travers, Chief Executive Officer, commented, "Building on Vuzix' advances in both its optics and tracking technology, we have been able to deliver affordable AR-enabled see-through head mounted displays. "The STAR 1200 XL's WFOV performance and upgraded camera enable more of the real world to be augmented, bringing a more encompassing AR experience. "This new STAR XL includes many advanced features that our customers have been asking for and we expect them to be used for a wide variety of applications." The glasses are available for order apparently, although we can't tell you what affordable means at the moment because the company's website is currently down.